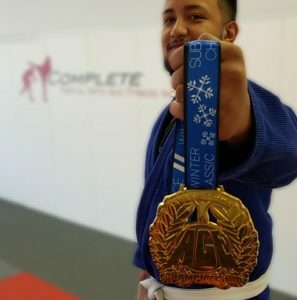 Interview: Waylon Cain talks his first BJJ Competition – Complete Martial Arts and Fitness Inc.
How long have you been training Jiu Jitsu? I was introduced to Jiu Jitsu at 15 years old. Since then I have trained on and off at various gyms across the province. When I moved to Regina at 19, I began training at Complete MMA, and have continued to train there for over the past three years. What made you decide to pick CompleteMMA to start your Jiu Jitsu journey? When I moved to Regina to pursue Post-Secondary Education, I wanted to train on a regular basis. A friend of mine referred me to Complete MMA, and spoke highly of the facility, the instructors, and the members of the gym. It was then I decided to take the free trial class that was offered through the program. The instructors were very knowledgeable and shown much discipline and appreciation for the art. Along with the friendly atmosphere within the facility, that is when I knew this was the gym for me! How many times a week do your train? I try to train on a regular basis, making it to the mat at least 3-4 times a week. I attend the Monday and Wednesday night beginner classes weekly, supplementing with morning or weekend training sessions. With the gym offering classes 7 days out of the week, I am better able to be flexible with my training as well juggling my full-time job. Most recently you entered your first Jiu Jitsu Competition. What made you decide to compete? Training in Jiu Jitsu started off as a fitness goal for me. In the beginning, I did not have the intention to compete. But as my time on the mats progressed and talking with fellow members of the gym, I set a new goal for myself to compete in my first competition. Once I had made my decision to compete in the Submission Ace Championship in Blackfalds, AB., all my training partners and coaches helped and supported me on my journey. Training for the competition was a great experience, with positive reinforcement for myself and to continue with my training. What was the experience like for your first time? Unbelievable! I enjoyed every moment of competing! The feelings I had while I was there on the mats is something unparallel to anything else I have experienced. For me, the competition was a self test – A place to see what I can do with the techniques I have been taught against an opponent and use those competition matches as a measuring tool to gauge my Jiu Jitsu and reflect to become better at the sport. As well, competing was extremely fun; I was always smiling while on the mat. I will continue to compete in future events for sure! What would you tell someone who is interested in entering in their first competition? Do it! I had a very great time! I went and competed alongside 2 other athletes from our Gym; Braydon Johnson and Joel Peltonen. Having friends/training partners there was a big help for myself and made the experience that much more enjoyable. Competing within a tournament has helped my Jiu Jitsu as a whole, as it tested me on many different aspects of my game. In creating the goal of competing in my first tournament, it had made me become more accountable. It pushed me to train harder, eat healthier, and as well to keep an eye on my weight to make sure I was ready for competition. Along with getting in better physical shape, it has given me the lesson of discipline. A skill that I have been able to implement within my day to day to life. Competing has changed my life not just at the gym, but within aspects of my personal and work life. When I started, I did not expect Jiu Jitsu to have such a large impact on my life! But I am very thankful it did. GOLD at the Winter Submission Ace Championships.